Home » Featured » Cruising Culture Shock, and the Cult of the QE2. Cruising Culture Shock, and the Cult of the QE2. For someone who prides themselves on the many adventures I’ve found myself in, whilst making my way overland through some far away country. I’ve always been one to frown upon any form of mass tourism, whether it be cruising, or just being on an organised tour to see a particular sight. Now don’t get me wrong, there is definitely a time and place for this type of travel, and some people would never cross into the next state, let alone to an overseas country, if this choice wasn’t put before them. To me the thought of being with the same people, day in and day out, and having every aspect of your trip dictated and programmed, would drive me over the edge. I stood firm by these belief’s until Liza stumbled across an extremely cheap fortnight’s cruise on the QE2 whilst trawling the travel section of the Sunday paper, as she religiously does. As the Borg in Star Trek say, ‘My resistance was futile’ when trying to defy this, as she had her heart set on going. My only worry was, would I become part of the collective? For anyone that knows Liza, they would be familiar with her not being unaccustomed to the finer things in life. Although we’ve been in some very remote parts of the world, and she can rough it with the best of them, Liza does enjoy the creature comforts that are presented to you in a more upmarket establishment. Her selling point to me was that the ship would sail through the Panama Canal, and she knew I would love to see it. I thought to myself, if I was going to do this, then it might as well be on the worlds most famous ship (well most famous that’s still afloat, as there’s that other vessel that sits motionless, on the bottom of the Atlantic. Cruising through the Panama Canal. If the QE2 was any longer, she wouldn't fit. The trip departed from New York, and made it’s way through the Caribbean to the Panama Canal, stopping at Florida and the tiny Island of Curacao along the way. Once through the Canal, and after a short stop in Panama City she made her way up the West coast of Central America, stopping at Acapulco, before we would complete our journey in Los Angeles. It was a cold and windy day, as we made our way down to the Manhattan Cruise Terminal. I was about to undertake my ‘Voyage of Discovery’ as the Cunard brochure defined it, loaded up with five times the baggage than we would need for a years backpacking, and all for a two week cruise. I forgot to mention that on the QE2 you are required to wear a suit to dinner each and every night. Those who know me would be aware that the only time I ever wear a suit, is to a wedding or a funeral. This was the first time I had ever travelled with a suitcase, and to put it mildly I was feeling quite weird. Whilst waiting to go through immigration, I glanced around and was quite astonished at what I saw. We were by far the youngest people about to board, most patrons would have been in their sixties and their were some, without a doubt in their eighties. To top it all off, there was an old man with a face mask, hooked up to some sort of oxygen bottle, on one of those electric scooters. At this point my first wave of panic began to set in, this was culture shock of a different kind. Ive had to deal with many difficult situations before, with some very odd customs in different countries, but this was a whole new ball game. What was I doing here I thought? Liza could sense me beginning to freak out and was getting a little agitated with my actions, as she’d been looking forward to this trip for quite some time. We cleared immigration and boarded the ship, and were presented with the keys to our cabin. We proceeded to make our way down to deck M2, Stateroom 5043 to be precise. I had pictures in my mind of the QE2 being immensely grand, with lavish furnishings and the like, but it was actually quite old and a little run down. Our cabin was very small and poky and was more like a room in a cheap hotel, than a cabin on the world’s most famous ship. At least we had a porthole, that allowed us to see a litlle day light, in between the crashing waves, as we were just above the waterline. Walking to our dinner table on the first night is when the second wave of panic hit me. As we got closer, I had visions of having to sit and chat aimlessly with some old man barely clinging to life, and having to take off his oxygen mask, every time he spoke. Liza and I with our table partners, Barbara, Annette, Bob and Donna. How would I get through two weeks of long five course meals with the same people each night, when we’d have nothing in common. As it turned out the people we were seated with were actually quite nice, and very down to earth. After a couple of nights and the usual pre-dinner drinks, we all loosened up a little, and we actually had a few laughs discussing some of the rich old fogeys who were on their 5th or 6th world tour. As well as others who would even spend a year at a time aboard the ship, circumnavigating the globe two or three times. We soon worked out that there was what I could only describe as, some sort of cult amongst the people who cruised on the QE2. They were indeed, ‘The Cruising Elite’. Not solely based on wealth, although world cruises on the QE2 don’t come cheap. They regarded sailing on the QE2 to be world cruising in its purest form. When you sparked up a conversation with some of these people, and merely mentioned the name of another ship, they would fly off the handle and call them nothing more than floating hotels, drifting aimlessly in the Caribbean, or Mediterranean. I did see their point though, and when the QE2 docked at some of the larger ports next to one of the newer ships, you really do get the feeling of the QE2′s style, and they were right, these other ships did look like floating hotels. After dinner on the first night, we headed out to the back deck to take some photo's. The more time I spent aboard, the more relaxed I would become. People were talking about us everywhere, and we were becoming quite well known throughout the ship, and most people referred to us as, ‘the young couple’ (if you call mid thirties young). The day spent cruising through the Panama Canal was definitely the highlight of my time aboard. When we anchored at places along the way, Liza and I would just take off and do our own thing, and not worry about the tours or shore excursions, so we did have a bit of freedom in that sense. The food was fantastic and I soon learnt that being on a cruise is no place to be, if you’re watching your weight. I must be getting soft in my old age, as I could actually see Liza and I doing something similar in the future, if the time and place were right. Whilst on board I did alot of reading about this famous ship. She was used as a Troop Carrier during the Falklands war and with a top speed of over 30 knots, the QE2 was one of the fastest ships in the ocean. In 2007 she was put out of service and bought by a wealthy Arab businessman, and retired to Dubai, to be converted into an actual floating hotel (I wonder what some of the cult members would have to say about that). At least she wasn’t going to be scrapped! Looking back on my time aboard, I suppose its like anything, you’ll never know if you never go. I’m glad Liza booked this trip and I stand proud when I say, I’m a card carrying member of the cult of the QE2. I did a transatlantic on the QE2, it was fantastic. I guess I am a cult member too, because I’ve been on the Queen Mary 2 as well, but describe it as a floating hotel not as grand liner style as the QE2. I never thought I would ever see myself doing a cruise, but looking back I really enjoyed it, although It’s not something I would do to regularly. After reading your post, I can agree entirely about the use of surface travel, and trying not to fly where possible, and your right the QM2 does look a little like a floating hotel if you ask me. I never thought I would ever see myself doing a cruise, but looking back I really enjoyed it, although It's not something I would do to regularly. After reading your post, I can agree entirely about the use of surface travel, and trying not to fly where possible, and your right the QM2 does look a little like a floating hotel if you ask me. Modern Communications, and the Death of Poste Restante. Whilst exploring the streets of Helsinki, we happened to chance upon the Hietaniemi Cemetery, and went for a bit of a stroll through it. 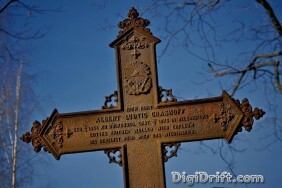 This was one of the many hundreds of Iron Crosses, that headed the graves. Copyright © 2010 DigiDrift.com. All rights reserved.